Driving for Uber in New York City just got a whole lot more prosperous thanks to the efforts of the IAM affiliate, Independent Drivers Guild (IDG). 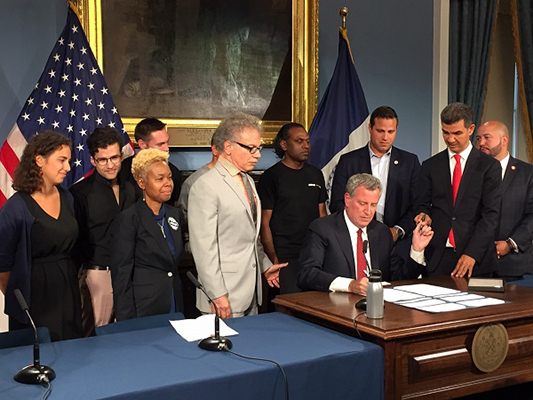 Yesterday, Mayor Bill de Blasio signed the law mandating all for-hire vehicle companies provide a tipping option. The signing of NYC council member Ydanis Rodriguez’s proposed law is the work of the IDG and their ability to unite thousands of ride-hail drivers and push for the change. In April, the New York City’s Taxi and Limousine Commission granted a petition by the IDG to create a rule requiring ride-hailing services to add in-app tipping which led to Uber to offer in-app tipping nationwide. The Independent Drivers Guild represents over 45,000 For-Hire Vehicle drivers in New York City. The IDG is the first nonprofit labor organization to negotiate a seat at the table with ride share company and the first to offer crucial new protections and essential benefits while building worker power.